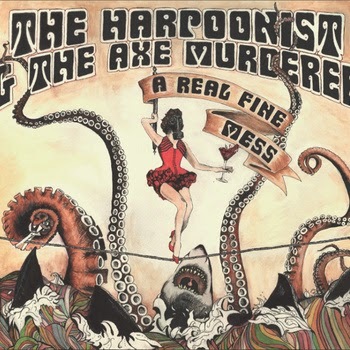 I just had the opportunity to review the most recent release, A Real Fine Mess, from The Harpoonist & The Axe Murderer and it's clever and entertaining. Opening with Black and Blue, a poppy track with roots in the blues but with modern feel and almost a Sting like quality. Do Whatcha has a cool stripped down Willie Dixon kind of sound with a cool blues guitar riff by Matthew Rogers (who also plays drums) and crying harp by Shawn Hall (who also sings and plays bass). Tea For Two almost has a calliope feel but with a light funky rhythm. Nice! Mama's In The Backseat has a country rock feel driven mostly but a thumping rhythm guitar. Hall goes apes**t on the harp making it quite a cool track. Closer To Death has a strong funky beat and a super blues harp sound. Feel Me Now has a lot of strong airplay characteristics with a bit of Journey mixed with R&B and a rock twist. Interesting. Don't Make'em Like They Used To has a feel of the Black keys if they were British. A bit of grind and a bit of pop. Very cool with nice backing vocals. My Paradise has a R&B feel with a bluesy kick. Again on this track backing vocals by Andrina Tuenne, Alexa Dirks and Dawn Pemberton add nice warmth. In And Out Of Love has a Bo Diddley beat and strong harp work over the lead work and direct drumming giving it a distinct NO feel. Sweat This Pain almost gets into a James Brown groove with funky guitar riffs and a groovy rhythm. Cry A Little returns to a more pure blues feel but still with a contemporary feel. Again backing vocals give it a R&B edge. This track has a different kind of vibe with a guitar/harp exchange, making it one of the coolest tracks on the release. With it's light guitar lead and harp overtones, In The End has an almost Neil Young feel but with a softer edge. This could easily be the best radio track on the release. Act Your Age is a bright, happy kind of track with a plucky rhythm guitar/bass feel. Again warm backing vocals give the track a special smoothness. Wrapping the track is A Real Fine Noise, the most eccentric track on the release and likely my favorite. With it's unusual rhythm pattern and underlying funk rhythm, this is a real nice finish for a solid consistent release.